Leslie Stifelman is Artist Faculty and the Founder/Director of the Musical Theater Performance Lab for the College for the Performing Arts at the New School. She has also held positions as Artist-in-Residence at Peabody Institute Johns Hopkins University and adjunct faculty at Pace University’s Commercial Dance Department. She is well known for her master class curriculum in Music Theater and is in demand as a teaching artist for New York City High School arts students from Frank Sinatra School for the Arts, Celia Cruz Bronx High School of Music, Songs of Solomon Choir and Fordham High School for the Arts. Leslie Stifelman is Artist Faculty and the Founder/Director of the Musical Theater Performance Lab for the College for the Performing Arts at the New School. This unique program incorporates student talent from MANNES COLLEGE, THE NEW SCHOOL FOR DRAMA and THE NEW SCHOOL FOR JAZZ into an expansive, innovative curriculum across the educational divisions in the performance and pedagogy of Contemporary Musical Theater. Guided by expert faculty and guest artists renowned for their work on Broadway, non-profit theater, opera, film and television, the Musical Theater Performance Lab is a collaborative theatrical company where students learn and apply the three essential skills – acting, singing and choreographic movement - that are required to be competitive as performers in Musical Theater, as well as creative leadership skills including directing, music directing and choreographing. Other skills required to create musical theater productions are also studied and actualized including composition, lyric writing and book writing. Leslie conceptualized, developed and implemented this program, which in just a few years has already produced four large-scale productions, inaugurated a dance department and welcomed celebrated industry guest artist to the faculty. With the Dean’s council, she is spearheading the state certification process for a BFA degree in Musical Theater. Leslie Stifelman successfully developed and implemented innovative curriculum for opera majors to experiment in creating works of Musical Theater, establish foundational technique in singing, dancing and acting, as well as professional development in auditioning. She is also currently the Music Supervisor for a conservatory-wide production of Leonard Bernstein’s Mass that will celebrate the composers 100th Birthday. 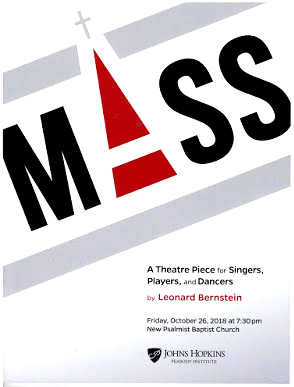 Along with the performers of the Peabody Opera Theatre, Peabody’s performance of the MASS will feature the Peabody Opera Theatre Orchestra, the Peabody-Hopkins Chorus, the Peabody Singers, dancers from the Conservatory’s new BFA program, instrumentalists from the Preparatory Wind Orchestra (playing as a Marching Band), the Peabody Children’s Chorus, the Morgan State University Choir, and a Community Partner Chorus including singers from the Baltimore City College High School Choir, the Baltimore School for the Arts Chamber Choir, the Johns Hopkins Concert Choir, the New Psalmist Baptist Church Choir, and Peabody Community Chorus.